I’ve run into a problem varnishing my figures. Certain acrylic paints, mainly Vallejo reds and browns, dry satin or slightly gloss and no varnish, or combination of finishes, will produce a matt finish. There is clearly some reaction between the paint surface and the varnish. I don’t know what it is but it is preventing the matting agent in the varnish migrating to the surface and disrupting the surface for a matt finish. However, all is not lost as this week I stumbled across a really simple solution. So I wondered if the talc would also act as a matting agent. In the past I have used fumed silica to improve the matting properties of Humbrol Matt Cote. The fumed silica was provided by a neighbour who worked in a paint laboratory but as he’s now retired I only have access to standard cosmetic talc. I bought a life times supply of colour and perfume free talc from the local Chemists and experimented with adding small amounts to samples of the problematic paints. I started adding very small amounts but quickly realised that the paint will take quite a lot of talc before refusing to flow. It’s easy to do on a palette so experiment for yourself to get the quantities right. I’m pleased to report that it works really well producing a very flat finish. There was little change in colour and any change is solely due to the lack of any surface sheen. 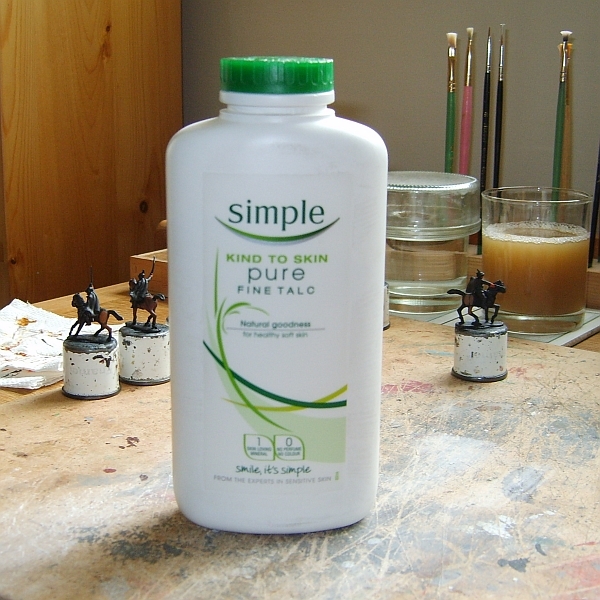 I’m going to continue adding talc to paints on my palette for while. I have added talc to some dropper bottles but I’m certain I’ve not yet added enough. I think I’ll get used to the technique first before attempting to fix a whole bottle. Follow up article after some months experience. I have never come across this. And will be interested to see how it works for me. I have posted a link on my Blog - I think that this is worth passing on to others. Thanks Tony. Let me know how you get on.